8 Wonders book wins award! The 8 Wonders of Kansas Guidebook is an award-winning 272-page book filled with over 800 beautiful photos of the 216 entries in the 8 Wonders of Kansas contests. It is certain to become a treasured Kansas classic whether it's used as a coffee table book or as a travel guide. In January 2012 the book was awarded a gold in the Media category for Travel Guide by the North America Journalist Travel Association. The top 8 Wonders entries in the categories of Architecture, Art, Commerce, Cuisine, Customs, Geography, History, People, and the Overall 8 Wonders are featured in a two-page spread. The remaining finalists are recognized on a half page. Mennonite Press, Newton, printed the book. 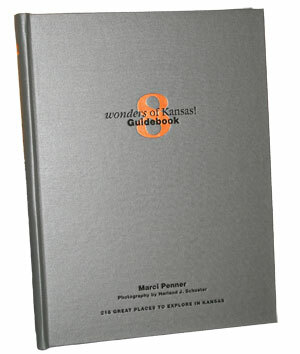 Koerperich Bookbinders of Selden, one of the 8 Wonders of Kansas Commerce finalists, bound the limited hard-back version. The guidebook is now on sale statewide in retail stores and gift shops at a price of $20.00, or you may order from our online store. A hardback version is available for $40.